A picture message in circulation on Facebook and other social media sites purports to show some cricket and movie celebrities joined BJP party in India. It says Virat Kohli, Sachin Tendulkar, Sunny Deol and Gautam Gambhir have joined forces with the Bharatiya Janata Party (BJP). Despite the claim, the message saying the celebrities joined BJP party is not true. 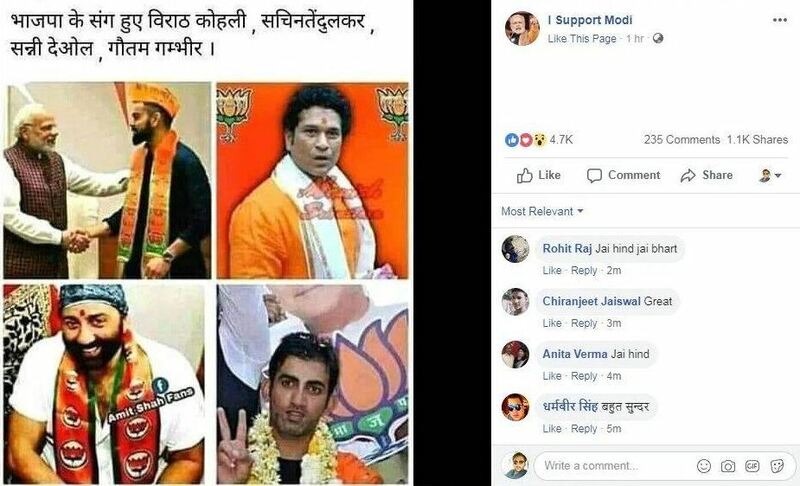 On 31st of January 2019, Facebook page I Support Modi posted a picture message saying the three well-known cricketers and Bollywood actor Sunny Deol have joined the BJP party. Amidst India gearing up for General Elections nation-wide, the post garnered thousands of shares and appeared on other social media platforms as well. Have the Celebrities Joined BJP Party? 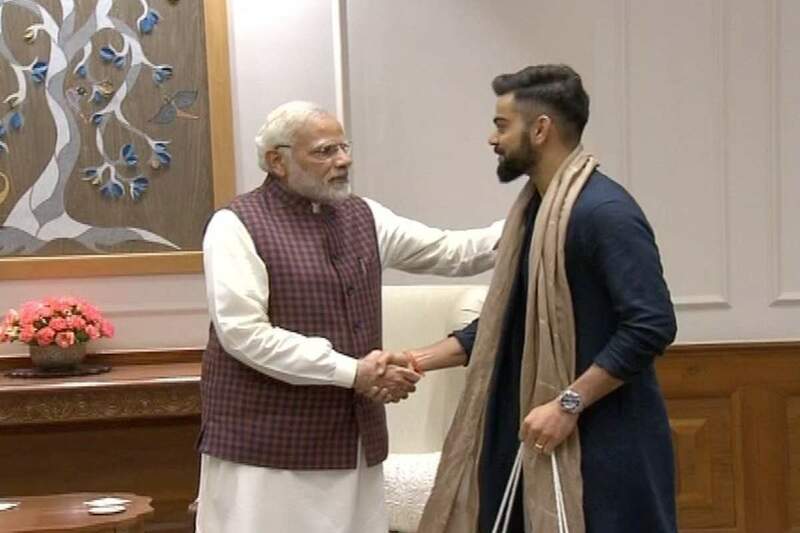 Firstly, the picture showing cricketer Virat Kohli meeting Indian PM Narendra Modi is an old one coming from December 2017. After their marriage, Virat Kohli and Bollywood actress Anushka Sharma met PM Modi and invited him for wedding reception. Note, the BJP party cap and shawl Virat is shown wearing are photoshop creations, which appeared before also. The BJP background behind Sachin Tendulkar is also photoshopped. The picture in fact shows the cricketing legend visiting Shree Siddhivinayak Temple in 2015 on his 42nd birthday. The picture of Sunny Deol is real, but it is when the Bollywood actor held a roadshow campaign for Satyapal Singh back in 2014 before 2014 Lok Sabha Elections. Likewise, the picture of Cricketer Gautam Gambhir is real, but it shows the cricketer campaigning for BJP candidate Arun Jaitley in Amritsar. There are no credible reports saying the celebrities have in fact joined the BJP Party. So, the picture message is a hoax. Note, the false stories appeared online earlier also.